I hope everyone had a fantastic Thanksgiving weekend! I’d had ambitious plans going into the weekend — to check out several open houses at local wineries and to head to a bar to watch the big Civil War football game — neither of which panned out. But I did participate in the West Linn Turkey Trot with my sister on Thursday morning and enjoy Thanksgiving dinner with my brother-in-law’s family at their home near Oregon City. I’d meant to post picture of the race much earlier, but I got distracted with other writing projects and sitting around home in my pajamas (mostly the latter). The Turkey Trot was held on paved and unpaved trails at Mary S. Young State Park in West Linn, Oregon. 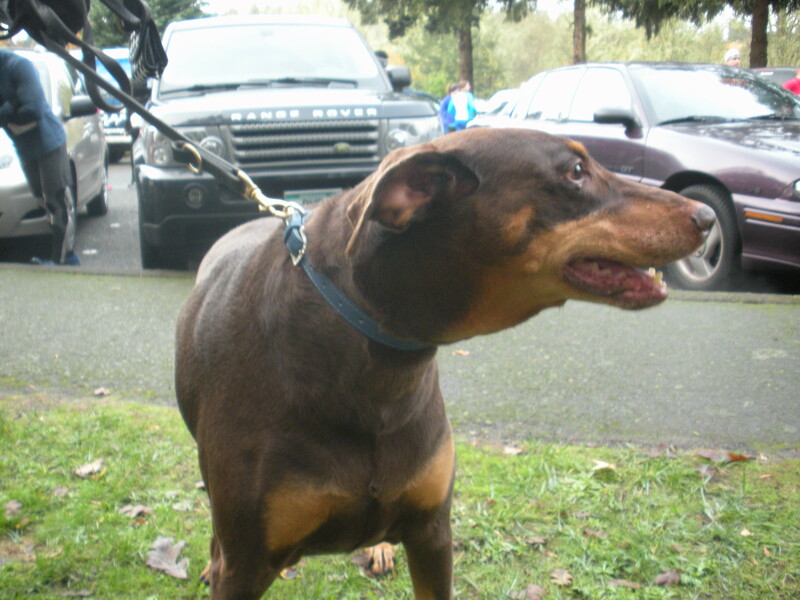 My sister and I had originally planned to jog/walk it, but when she arrived at the race with her 10-year-old Doberman, Sydney, the dog was just too excited not to participate. We were told the dog could participate if we stuck near the back of the pack. Fortunately, the park was great for hiking too. Three things I was thankful for this Thanksgiving: (1) that my sister agreed to do the race with me; (2) that the rain temporarily halted, so we didn’t get incredibly muddy; and (3) that I live in such a beautiful state. Seriously, how beautiful is this setting for a Thanksgiving Day run? Participating in the Turkey Trot reminded me how much I miss running. I’d given it up in Las Vegas after a combination of: my frustrations with the heat and wind, limited places to run near my home, and being constantly harrassed by passing drivers and exhaust smoke. I’ve managed to keep in fairly good shape thanks to karate, but now I live in a community with a vibrant running culture and loads of trails, so I think it’s time to pick it up again. I hope to register for my next race, an all-women half-marathon, by the end of this week. Prior to our move to Oregon, I wrote about some of the challenges my husband and I have faced this year. While we so far feel like Oregon is a much better fit for us than Las Vegas, it has taken some time to get used to our new community. This is the first time in my life I’ve moved to get away from something, rather than to move because of school or a new job. We are finally starting to meet new people, and to feel assured that this move was the best decision for our careers. So this weekend, instead of going wine tasting or to a bar to watch football, I start to write again. I’d started an autobiographical novel back in 2007, but haven’t written anything on it since 2010. This new book I am working on is a memoir, based on my experiences living in 4 continents in my 20s. While it is much too soon to know if I would ever try to publish this story, I feel it is a story that needs to be written down, at least for my own sake. Perhaps it is what has been separating me from moving on from my past, and getting on with the rest of my life. This entry was posted in Introspection, Oregon, Running, Writing. Bookmark the permalink.